DEAR VISITOR, THANK YOU FOR BROWSING OUR WEBSITE. AT THIS MOMENT IT IS IMPOSSIBLE FOR US TO TAKE IN ANY CATS OR KITTENS AS WE HAVE DONE IN THE PAST. WE HAVE FAR TOO MANY DOGS EVERYWHERE INCLUDING AROUND OUR SMALL CATTERY IN THE GARDEN. PLEASE LOOK FOR CAT RESCUE CENTRES. We have many different pups, dogs and kittens for adoption. Of course not all live with us. Many adults are in the shelters we work with and the cats/kittens are in foster. Please contact us via our email so we can help you find the pet you are looking for. This is the theme we have chosen to post on our home page. They need you and us, indeed. When we saw this picture we thought: yes, this is it. 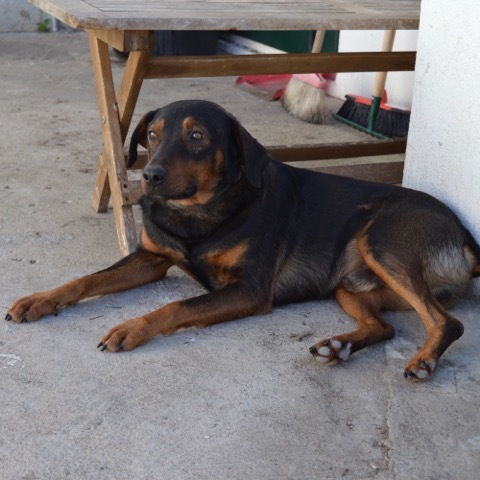 The female, typical mixed breed stray, had pups somewhere, dumped and looking for TLC from a human being. Helping these animals to recover and find a new, loving home is definitely OUR mission. So please look further on this site to see who we are: the faces behind 2ndHand4Footers, what we do and the lovely pups/dogs we have for adoption. Some are with us and some in temporary care. All need kind, loving homes. Together we can provide these.